A rainwater harvesting system comprises components of various stages - transporting rainwater through pipes or drains, filtration, and storage in tanks for reuse or recharge. 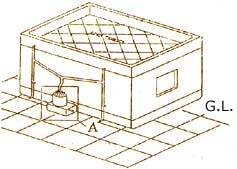 The common components of a rainwater harvesting system involved in these stages are illustrated here. 1. Catchments: The catchment of a water harvesting system is the surface which directly receives the rainfall and provides water to the system. It can be a paved area like a terrace or courtyard of a building, or an unpaved area like a lawn or open ground. A roof made of reinforced cement concrete (RCC), galvanised iron or corrugated sheets can also be used for water harvesting. Locally available material such as plain galvanised iron sheet (20 to 22 gauge), folded to required shapes. Semi-circular gutters of PVC material can be readily prepared by cutting those pipes into two equal semi-circular channels. Bamboo or betel trunks cut vertically in half. The size of the gutter should be according to the flow during the highest intensity rain. It is advisable to make them 10 to 15 per cent oversize. Gutters need to be supported so they do not sag or fall off when loaded with water. The way in which gutters are fixed depends on the construction of the house; it is possible to fix iron or timber brackets into the walls, but for houses having wider eaves, some method of attachment to the rafters is necessary. Conduits are pipelines or drains that carry rainwater from the catchment or rooftop area to the harvesting system. Conduits can be of any material like polyvinyl chloride (PVC) or galvanized iron (GI), materials that are commonly available. A first flush device is a valve that ensures that runoff from the first spell of rain is flushed out and does not enter the system. This needs to be done since the first spell of rain carries a relatively larger amount of pollutants from the air and catchment surface. 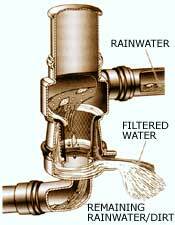 The filter is used to remove suspended pollutants from rainwater collected over roof. A filter unit is a chamber filled with filtering media such as fibre, coarse sand and gravel layers to remove debris and dirt from water before it enters the storage tank or recharge structure. Charcoal can be added for additional filtration. A simple charcoal filter can be made in a drum or an earthen pot. The filter is made of gravel, sand and charcoal, all of which are easily available. Sand filters have commonly available sand as filter media. Sand filters are easy and inexpensive to construct. These filters can be employed for treatment of water to effectively remove turbidity (suspended particles like silt and clay), colour and microorganisms. In a simple sand filter that can be constructed domestically, the top layer comprises coarse sand followed by a 5-10 mm layer of gravel followed by another 5-25 cm layer of gravel and boulders. Most residents in Dewas, Madhya Pradesh, have wells in their houses. Formerly, all that those wells would do was extract groundwater. But then, the district administration of Dewas initiated a groundwater recharge scheme. The rooftop water was collected and allowed to pass through a filter system called the Dewas fillter, designed by Mohan Rao , district collecter of Dewas, and engineers of the rural engineering services. The water thus filtered is put into the service tubewell. The filter consists of a polyvinyl chloride (PVC) pipe 140 mm in diameter and 1.2m long. There are three chambers. The first purification chamber has pebbles varying between 2-6 mm, the second chamber has slightly larger pebbles, between 6 and 12 mm and the third chamber has the largest - 12-20 mm pebbles. There is a mesh at the outflow side through which clean water flows out after passing through the three chambers. The cost of this filter unit is Rs 600. When rainwater is harvested in a large rooftop area, the filtering system should accommodate the excess flow. A system is designed with three concentric circular chambers in which the outer chamber is filled with sand, the middle one with coarse aggregate and the inner-most layer with pebbles. 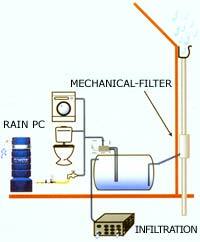 S Vishwanath, a Bangalore water harvesting expert, has developed a rainwater filter "VARUN". According to him, from a decently clean roof 'VARUN' can handle a 50 mm per hour intensity rainfall from a 50 square metre roof area. This means the product is relatively standardised. For new house builders we therefore can recommend the number of downpipes they have to optimise on and the number of filters they will need. The introducton of horizontal roughing filter and slow sand filter (HRF/SSF) to treat surface water has made safe drinking water available in coastal pockets of Orissa. The major components of this filter are described below. 1) Filter channel : One square metre in cross-section and eight m in length, laid across the tank embankment, the filter channel consists of three uniform compartments, the first packed with broken bricks, the second with coarse sand, followed by fine sand in the third compartment. The HRF usually consists of filter material like gravel and coarse sand that successively decreases in size from 25 mm to 4 mm. The bulk of solids in the incoming water is separated by this coarse filter media or HRF. 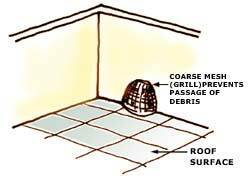 At every outlet and inlet point of the channel, fine graded mesh is implanted to prevent entry of finer materials into the sump. The length of a channel varies according to the nature of the site selected for the sump. 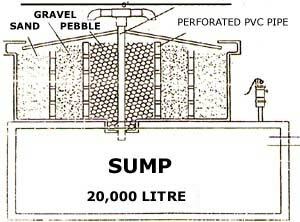 2) Sump: A storage provision to collect filtered water from the tank through the filter channel for storage and collection. While HRF acts as a physical filter and is applied to retain solid matter, SSF is primarily a biological filter, used to kill microbes in the water. Both filter types are generally stable, making full use of the natural purification process of harvested surface water and do not require any chemicals. AcquaSure, a consortium of three specialist Netherlands-based companies, has developed a system for the conversion of rainwater to drinking water in the form of a Rainwater Purification Centre (RainPC). RainPC is developed by scaling down the multi-staged water treatment method (MST), which involves screening, flocculation sedimentation and filtration and incorporating existing technologies like upward flow fine filtration, absorption and ion exchange. Coming in a small compact 26 kg unit, the RainPC offers an affordable solution by converting rainwater into drinking water. RainPC is made of ultra violet resistant poly-ethylene housing and cover, stainless steel rods and bolts, a nickel-brass valve and an adapter for maintaining constant volume. Xenotex-A and activated carbon catridges along with ultra membrane filtration or micro-membrane filtration modules incorporated in the RainPC has the capacity to deal with E-coli and the potential of meeting the Dutch as well as World Health Organisations (WHO) water regulation standards. The components can also be transported individually to be assembled at the site. Three product types are available based on their microbial contaminant removal capacity. This technology is ideally suited for virtually any situation and is a blessing particularly for those who have little or no access to regular safe drinking water. Needs no power and operates at low gravity pressure (0.1 bar upward). The system is capable of providing a constant flow of about 40 liters of rainwater per hour, enough for a family of five for drinking, cooking and bathing purposes. Maintains nearly constant volume irrespective of water pressure. The Xenotex-A and activated carbon cartridge processes up to 20,000 liters and can be regenerated up to 10 times. Cost per 1000 litres is as low as US$ 2 to 3. EA Water Pvt Ltd has launched a unique Rainwater Harvester, which filters runoff water from roads, which generally contains oil and grease. This system has been installed in the Gymkhana club, Sector-15, Faridabad, Haryana. Rajit Malohtra, project in charge, of this company explained that the water harvesting system installed at the club has a sand filter, which filters silt from runoff harvested from roof, lawns and parking area. The cost of the filter is around Rs 60,000. According to Wessels (1994), concerns over the possible negative health effects of rainwater utilisation led to some opposition. The Federal Office of Health, for example, intially objected to its use for washing clothes, personal hygiene and even for toilet flushing, due to possible risks of infection and allergic reactions. Long-term investigations by the health offices in Hamburg and Bremen, however, have yielded positive results with respect to the use of water for washing purposes and have confirmed that rainwater sources do not present a health risk. Private companies such as WISY, based in Kefenrod in Germany, are playing an important role in promoting rainwater use by developing pumps and filter devices to improve water quality. WISY has developed a simple filter system, which can be attached to a standard household downpipe. Under conditions in Germany (assuming a mean annual rainfall of 650mm/year), this can divert and filter 90 per cent of the runoff from a roof area of up to 200 square metre. (fig a). 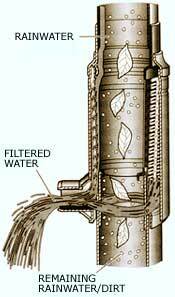 A filter collector diverts 90 per cent of rainwater to a storage tank through a 0.17 mm stainless steel mesh filter. (fig b). A larger vortex fine filter can cope with run-off from roof areas of up to 500 square metre. (fig c). A floating fine suction filter for ensuring that the water pumped from the tank is extracted from the cleanest part of the tank and is free of particulates has also been developed. Another company, MALLBETON, a manufacturer of concrete tanks and filters, based in Germany, is marketing a tank design which manages any overflows (Konig, 1998). This is done by constructing the top half of a sub-surface tank from a porous concrete ring, which allows water to gradually seep into the ground. While this reduces the volume of water available, it does make householders eligible for waivers on their rainwater drainage fees. These fees are already applied to householders and businesses in about 25 per cent of Germany. The charges that are levied on each square metre of roof area and sealed surroundings can be substantial, such as in Bonn, so waivers often provide significant savings. There are various options available for the construction of these tanks with respect to the shape, size and the material of construction. Shape: Cylindrical, rectangular and square. Material of construction: Reinforced cement concrete, (RCC), ferrocement, masonry, plastic (polyethylene) or metal (galvanised iron) sheets are commonly used. Position of tank: Depending on space availability these tanks could be constructed above ground, partly underground or fully underground. Some maintenance measures like cleaning and disinfection are required to ensure the quality of water stored in the container. Rainwater may be charged into the groundwater aquifers through any suitable structures like dugwells, borewells, recharge trenches and recharge pits. 1. Recharging of dugwells and abandoned tubewells. In alluvial and hard rock areas, there are thousands of wells which have either gone dry or whose water levels have declined considerably. These can be recharged directly with rooftop run-off. Rainwater that is collected on the rooftop of the building is diverted by drainpipes to a settlement or filtration tank, from which it flows into the recharge well (borewell or dugwell). If a tubewell is used for recharging, then the casing (outer pipe) should preferably be a slotted or perforated pipe so that more surface area is available for the water to percolate. Developing a borewell would increase its recharging capacity (developing is the process where water or air is forced into the well under pressure to loosen the soil strata surrounding the bore to make it more permeable). If a dugwell is used for recharge, the well lining should have openings (weep-holes) at regular intervals to allow seepage of water through the sides. Dugwells should be covered to prevent mosquito breeding and entry of leaves and debris. The bottom of recharge wells should be desilted annually to maintain the intake capacity. Settlement tanks are used to remove silt and other floating impurities from rainwater. A settlement tank is like an ordinary storage container having provisions for inflow (bringing water from the catchment), outflow (carrying water to the recharge well) and overflow. A settlement tank can have an unpaved bottom surface to allow standing water to percolate into the soil. In case of excess rainfall, the rate of recharge, especially of borewells, may not match the rate of rainfall. In such situations, the desilting chamber holds the excess amount of water till it is soaked up by the recharge structure. Thus, the settlement chamber acts like a buffer in the system. Any container, (masonry or concrete underground tanks, old unused tanks, pre-fabricated PVC or ferrocement tanks) with adequate capacity of storage can be used as a settlement tank. 3. Recharging of service tubewells. In this case the rooftop runoff is not directly led into the service tubewells, to avoid chances of contamination of groundwater. Instead rainwater is collected in a recharge well, which is a temporary storage tank (located near the service tubewell), with a borehole, which is shallower than the water table. This borehole has to be provided with a casing pipe to prevent the caving in of soil, if the strata is loose. A filter chamber comprising of sand, gravel and boulders is provided to arrest the impurities. A recharge pit is 1.5m to 3m wide and 2m to 3m deep. The excavated pit is lined with a brick/stone wall with openings (weep-holes) at regular intervals. The top area of the pit can be covered with a perforated cover. Design procedure is the same as that of a settlement tank. Percolation pits, one of the easiest and most effective means of harvesting rainwater, are generally not more than 60 x 60 x 60 cm pits, (designed on the basis of expected runoff as described for settlement tanks), filled with pebbles or brick jelly and river sand, covered with perforated concrete slabs wherever necessary. A recharge trench is a continuous trench excavated in the ground and refilled with porous media like pebbles, boulders or broken bricks. 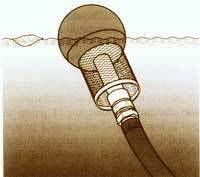 A recharge trench can be 0.5 m to 1 m wide and 1 m to 1.5 m deep. The length of the recharge trench is decided as per the amount of runoff expected. The recharge trench should be periodically cleaned of accumulated debris to maintain the intake capacity. In terms of recharge rates, recharge trenches are relatively less effective since the soil strata at depth of about 1.5 metres is generally less permeable. For recharging through recharge trenches, fewer precautions have to be taken to maintain the quality of the rainfall runoff. Runoff from both paved and unpaved catchments can be tapped. To collect the runoff from paved or unpaved areas draining out of a compound, recharge troughs are commonly placed at the entrance of a residential/institutional complex.These structures are similar to recharge trenches except for the fact that the excavated portion is not filled with filter materials. In order to facilitate speedy recharge, boreholes are drilled at regular intervals in this trench. In design part, there is no need of incorporating the influence of filter materials. This structure is capable of harvesting only a limited amount of runoff because of the limitation with regard to size. In this method water is not pumped into the aquifer but allowed to percolate through a filter bed, which comprises sand and gravel. A modified injection well is generally a borehole, 500 mm diameter, which is drilled to the desired depth depending upon the geological conditions, preferably 2 to 3 m below the water table in the area. Inside this hole a slotted casing pipe of 200 mm diameter is inserted. The annular space between the borehole and the pipe is filled with gravel and developed with a compressor till it gives clear water. To stop the suspended solids from entering the recharge tubewell, a filter mechanism is provided at the top.